Where is hope in your life? For some, hope is the first candle to be lit when the power goes out in the storm. Hope is that positive percentage you do have of beating the cancer. Hope is the faint line on that stick when you’ve been struggling to get pregnant. It’s the first ray of sunshine through your window after a tearful, difficult night. Hope is the flicker of maybe, just maybe. Hope is the fuel of faith and dreams. 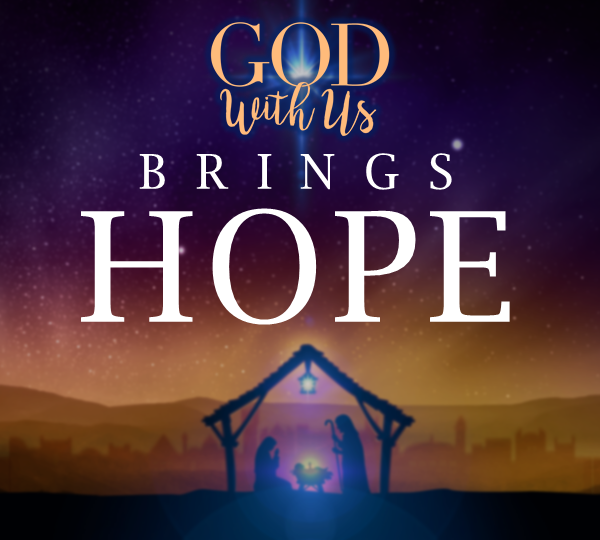 And hope is what we celebrate on this first Sunday of Advent. That’s the way God has been working throughout history. As we have been seeing in our Genesis Origins series, back in the very beginning, in the way God intended for His creation, He walked freely and openly with Adam and Eve. He was with us, and humanity enjoyed wholeness and intimacy with God. But you know the story. Adam and Eve chose their own way instead of God’s way. That’s sin. Separation divided God and humanity. The brokenness of our world that we know far too well is the ongoing result. But do you realize that ever since then, God has been working toward restoration and healing and wholeness for us and all He has made? This is the overall story of the Bible. Throughout it, we can see God making a way and giving and reminding His people of hope that He is still at work. The first is hope based on God’s Word. Part of God with Us is the written word that He has left us. The Bible includes promises to His people—both long ago and today. They are beacons of hope. They are reminders that can penetrate our hearts and spirits and assure us that no matter what we are facing, no matter how bleak tomorrow looks, no matter how bad the pain, God will never leave us or forsake us. And nothing can separate us from Him. The second way we can rekindle hope is to put our focus on God’s character—on who He is and promises to be. This is the promise He left us with to give us a foundation of confidence and boldness: “I am with you always, even to the very end of the age” (Matthew 28:20). This is a promise worthy to fuel our hope. Because God is true to His character, because of who He is, we can take hope in Him. The third way we can find and choose hope is by focusing on God’s faithfulness. How has God worked in your life? What are those moments and memories when you have experienced God’s work in your life? You know those times when you had no doubt He was there and He was working. Maybe it’s been recently. Maybe it’s been a long time ago. But in those circumstances swirling around you, the presence of God’s Spirit was with you. Focusing on gratitude can renew and grow our hope. Recognizing and appreciating the good that God has shown us in the past can increase our hope for all He will do in the future. Sharing this gratitude and hope with those who love and support us can multiply its effects. As we nurture this living hope, it can sustain us through our darkest days as we wait for God to move.